As part of our ongoing commitment to build an inspiring, global network of women with alopecia areata, we're sharing another personal story of a strong woman coping with her alopecia. 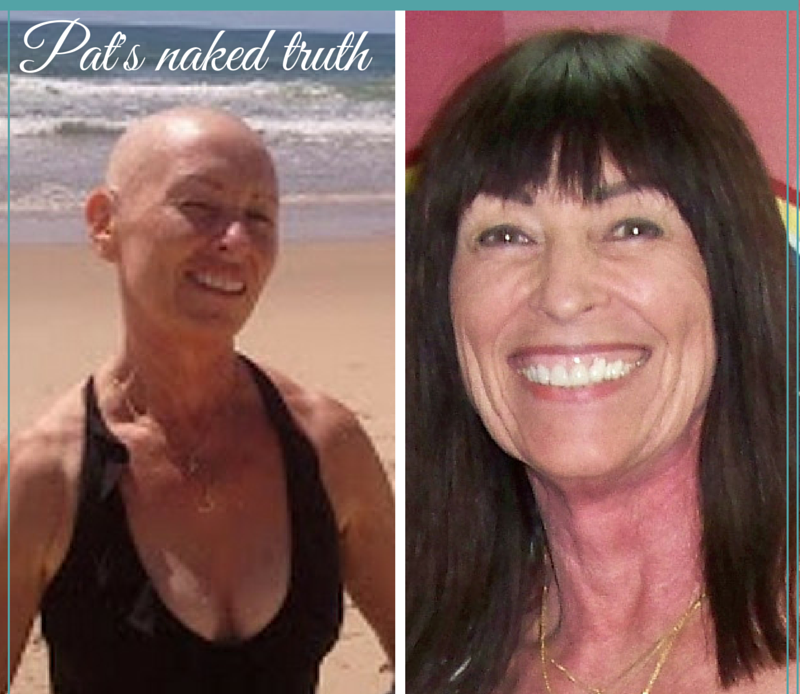 Below, are excerpts of my recent interview with Pat from Queeensland, Australia -- an active woman with alopecia universalis who is the only person diagnosed in her family. When it comes to finding what works best with flexibility, perserverance and humor, in my mind Pat stands out as a motivator we can all learn from. When faced with challenges, Pat figures out how to enjoy her active pursuits with and without hair. What was it like when you were first diagnosed? It was 1989 and I was 38 when I first noticed my cent sized bald spot. I was referred to a dermatologist but he dismissed my fears by behaving as if he thought I was overreacting. In fact, I was terrified and incapable of expressing myself. I thought him to be dismissive and unhelpful. I addition, there were major family stresses in my life at that time . It became increasingly difficult for me to visit the dermatologist due in large part to his attitude and because I saw no improvement from scalp steroid injections other than tufts of white hair. Bald patches were increasing all over my head. Within 9 months, all the hair on my body fell out completely and it stayed this way for 4 years. Then suddenly, with no treatment at all after years of no hair, it started to regrow. I thought my time with alopecia had ended. How wrong I was! Over time, I've also been affected by other auto-immune conditions. Early on what was most helpful, least helpful? I really think doctors should be more respectful and realise the emotional effect on patients and show a more caring attitude. It would have made all the difference to me at the time. I tried acupuncture for a while. In contrast to the dermatologist, the acupuncturist showed a very different attitude and was quite excited at the prospect of having me as a patient. I'm sure he was as disappointed as I was when the alopecia didn't resolve itself. Was the second round of hair loss a repeat of the first? Within two years of regrowth, the bald spots re-started and increased until once again I lost every hair on my body. This time around it was the age of the internet....a life-saver for me as I was able to connect with others and didn't feel as isolated and alone. I joined a couple of groups where I'm still a member and now am a moderator on one of them. I felt more in control of my emotional helath and decided I wouldn't let alopecia decide how I would live my life. I was a runner and previously I stopped doing this. But this time I continued to run albeit with a hat or scarf. How do you work eyebrows, lashes and hair into your alopecia lifestyle? I have enougn eyelashes now to put on mascara which I'm very pleased about. There are also some very unruly hairs on my eyebrows which seem to have forgotten the directon they are supposed to grow! I pluck some of the really weird ones, but keep the others and paste them down with a wax pencil as it adds to the illusion that I have eyebrows. I had my eyebrows and eyeline tattooed a couple of times over the years and wouldn't be without them. During this second bout, I decided to get a wig. Through trial and error I now wear wigs I am happy and comfortable with. I feel like myself when I put on my wig and rarely go out without it. At times I wear a scarf and hat and I have gone swimming with my head bare a couple of times. I wear a wig to the gym, too, as I'm unable to do cardio these days so sweat isn't a problem. I am a big admirer of those who go wigless, but I feel more like me with a wig on. I see it as just another way of putting on clothes/makeup. Also it keeps my head warm in winter. I used to feel like a fake when I wore a wig, but I don't anymore. Today wearing a wig IS me. It's who I am today. Were there moments that altered your perspective? When walking into a shop I saw a young woman with no legs in a wheelchair. It was my first wakeup call to realise I may have lost my hair but I could still walk, run and basically do everything I used to do. I do StandUp Paddling every Sunday. Connecting with others on the internet really helped me to get over myself. I had viewed my alopecia as a monster controlling my body, but gradually I became friends with it. I've come a long way from not wanting to look at myself in the mirror! What esle did you do to restore normalcy? In the early 2000's I joined Toastmasters to overcome my fear of people looking at me (even with hair!). Through gaining confidence in that organisation, I made a speech about alopecia and my journey with it to my club. A few years later I got to talk at a Toastmaster conference about alopecia and the funny things I've experienced along the way --- like losing my wig in the surf. It was a wonderful moment for me that I could stand up and talk about it with humour rather than as the tragedy I had previously viewed it as being. I can laugh at myself these days and see the funny side rather than remaining in tragic mode. That's really helped me cope with my down days which are rather more like down moments now. At the launch of the Bald Girls Do Lunch nonprofit, you were one of the first people we followed online. Did you feel like a pioneer? Because there is more online support, people aren't freaking out like they used to when first diagnosed. Of course, it's still traumatic for new ones, but it seems like they get to acceptance far quicker. I didn't feel so much like a pioneer in alopecia support as feeling tremendous relief that other people were experiencing what I was going through. No matter how supportive my husband was, he didn't understand the panic I was going through. Other alopecians online knew exactly how I felt. We want to thank Pat very much for sharing her story! Feel free to use the space below to tell us some turning points in your journey with alopecia areata.